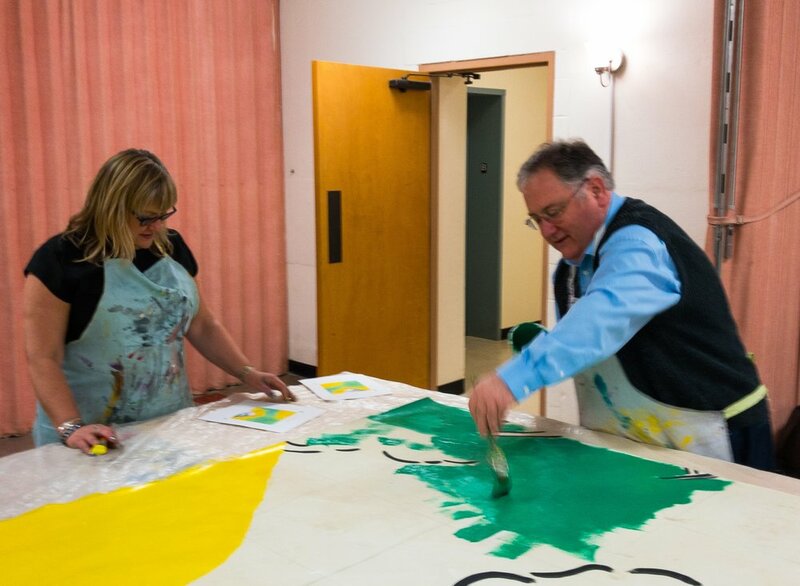 Since summer 2017, I have been working as the lead artist on a mural project for Trinity Lutheran ChurchChurch. With the installation happening in summer 2018, this project with Dane Arts Mural Arts exemplifies just how much it takes to bring a public and community project to life. Many hands helped paint this mural. Many voices contributed to the story and ideals it represents. I spent the summer getting to know the congregation through community interviews. Trinity wanted a mural that represented a "Journey to a New Beginning." The concept honors their heritage and ever-evolving community, the importance of pilgrimage in faith and human history, and the church's stance with LGBTQ+, refugees, and commitment to activism and inclusion. I love conducting community interviews. They give me a chance to learn about the people that I'm designing for and what's important to them. As an artist who does a lot of work with schools and as a part of social causes, I am also constantly thinking about the roles of beliefs (religious, political, and otherwise) in the shaping of the societies we live in. Art easily becomes a platform to discuss what matters to us with our peers. It becomes a chance to meet our challenges--and choose how to overcome them. It becomes an opportunity to negotiate and connect with other people over who we are as a society--and whom we want to be. For the Trinity project, I spoke with a church member who became ordained when women were finally allowed to join the ministry. She told me about being involved in the rewriting of the scriptures to no longer refer to God as Father or "he/him/his." She and other congregation members talked about the challenges that come with necessary change, and also about the core of spirituality that remains important in the midst of the debates of what the practice of that spirituality should look like. Almost everyone I met with talked about the music and the choir being central to the church. Long-timers and new members alike said they chose this church because it felt like home. When I asked what they wanted their neighbors to know about them, they emphasized their commitment to activism and to inclusion, and opening their space to the community to do social good regardless of the religious affiliation of their community members. Following the interviews, I focused on imagery that held religious significance and also reached beyond to community citizenry, activism, and stewardship. The people in the mural represent the people in the congregation, including the children who dance in the aisle during Sunday service. "We used to be a much stricter congregation," said a number of the older members of the church, some of whom have attended Trinity for as many as 70 years and tell stories from Sunday school and getting baptized there. "We're much more laid back now," they laugh. The holy Trinity is alluded to throughout the imagery (three people, three concentric navigation forms, three doves), as the number three has recurred throughout different religions in human history. The Ash Tree, a long-standing Christian symbol, was also relevant in Norse mythology, as the Tree of Life that connected Earth with the After Life. This also connects Trinity’s mural to the church’s Norwegian heritage and founders. 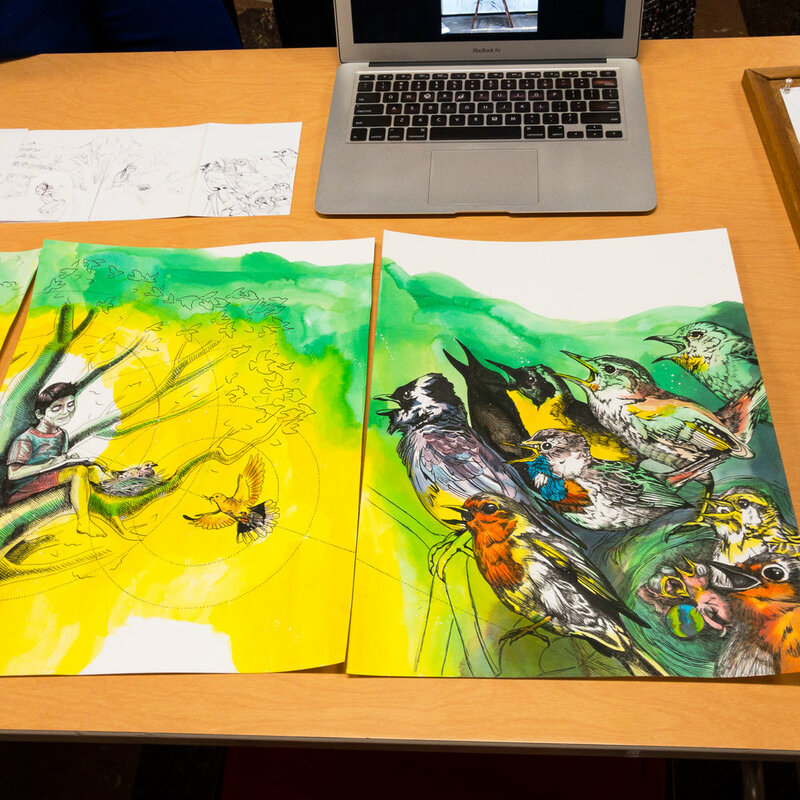 Finally, the mural design features a "choir of birds," which consists of Old and New World songbirds, some of which are known to migrate in mixed species flocks to form larger groups for protection. Music has been a fundamental part of Trinity and the Lutheran liturgy, and is perhaps the root of why this community values creativity so deeply. We had more than 15 community paint days with Trinity Lutheran Church and members from the greater Madison community. SAIL East and Seed to Table students at Goodman Community Center, staff at Canopy Center, UW Service Learning students, and the Boy Scouts all had a hand in creating this mural. I made a point to talk with the student as we cleaned up and rolled up the mural panels. I asked him what it was like going to school there. “Everything’s too easy. There’s nothing to get excited about,” he said. “So you feel under-challenged?” I asked. He nodded. Then we got back to other conversations about music and the news. Religion, politics, and activism have always been powerful ways to organize people. Many people are uncomfortable with political discourse and would rather not "talk politics," especially in the places where they work, learn, play, and pray. I understand that, and I also believe it shouldn't be uncomfortable. Religion, politics, and activism are all vehicles for ideology and service towards our community. Religion asks us to reflect on our values and have faith in the camaraderie of our peers. Politics asks how we can best organize and utilize our resources across the community. Activism asks us to pay attention to the ways in which we are falling short, to serve the underserved, to see the unseen. They are separate, yet similar; connected, yet distinct. As a community, we need to become comfortable discussing all of them in order to best understand their benefits, know their boundaries, and acknowledge both the limits and potential of the human being. As an artist and storyteller, I am honored to work with Trinity to help them share who they are with the neighborhood at large, as a house of faith and as an active community citizen. Art has the power to enrich the community and to help people congregate around shared beliefs and values. I hope that this mural may become a beacon of the community stewardship, diverse culture, openness, and creativity that make us who we are. In the past I have only ever done art for my own gain. I never had to take others ideas into consideration. I had complete control of the work and the process. Collaborative public art has several facets that I had not even considered before working with Dane Arts Mural Arts through the UW Service Learning class. While working with DAMA I was able to take part in collaborative artworks. DAMA’s public works take many ideas and skills into consideration when creating a project and the final public art has an extensive process behind it. This involves gathering ideas, discussing, gathering materials, teaching artists, planning dates and times, and so many other steps I’m sure I was blind to. The process of creating the art can be just as important as the finished product. In my time with Dane Arts Mural Arts, I had the opportunity to make little contributions to several projects. This work allowed me to experience how community members participating in DAMA’s projects often feel, like a small part of something bigger, something lasting. Each work has so many hands involved. These pieces are cohesive yet being created by so many. The final work is unified. This reflects the students, community members, and artists that come together to create one piece. Even after the work is completed it brings people together. Public art connects people who may just be stopping for a closer look or viewing it daily. The community has a shared appreciation for public art. Often cities want public art but do not have organizations with the resources and dedication to public art that DAMA has. My time with DAMA was so insightful to how projects run start to finish. There was an incredible amount of flexibility and optimism displayed by the DAMA staff. I am so grateful I was able to work alongside the DAMA artists and contribute to public art in Dane County. My view on public art has drastically changed. When I was assigned to work with Dane Arts Mural Arts through my Service Learning Class at the University of Wisconsin-Madison I assumed that I would just be painting murals. But, I didn’t pick up a paintbrush the entire time. It’s not to say we weren’t doing art and definitely not to say we didn’t do anything with our time. Instead, I gained a look at some of the behind the scenes work required to pull off the elaborate murals this organization does and didn’t even realize how little ‘art’ I’d actually done until this moment. To say that I didn’t learn anything or that I did not enjoy it would be erroneous too; in fact, it has been a very fun and different experience from what I first expected. 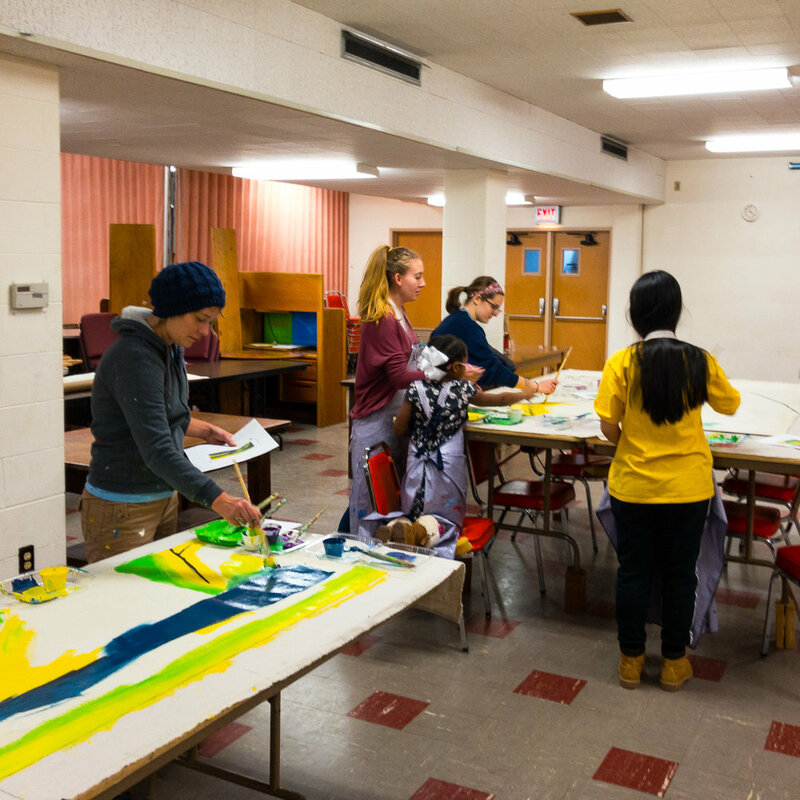 While Dane Arts Mural Arts has their hand in many different projects all at once, the students from the UW were asked to focus mainly on the Storm Drain Mural Project. The Madison Area Municipal Stormwater Partnership and the Dane County Land and Water Resource Department funded this mural project in an effort to use art to educate people in Dane County that the water that goes into a storm drain flows directly into our lakes, rivers, and streams. This artful phenomenon has been popping up all over cities in America, and just takes a quick search online to see what an impact they have. Out of the 20 storm drains the county cleared for this project, half of them would be ‘designed’ by kids at local schools. After a day of learning from the stormwater experts about the storm drains and how we can help the environment, we were off to the schools to work with the children. As someone who loves the environment, I was pretty happy with this project. We were working with elementary school all the way up to high school. Sometimes the younger children didn’t understand every detail or weren’t great at grasping the bigger words like ‘water treatment facility’ or ‘phosphorus’, which meant that we had to be able to think quick on our feet or learn for the next time which topics might go little over their heads. After a short presentation, we asked each kid to draw what he or she would like to see on a storm drain. We would take these drawings and consolidate them into two or three designs. Some kids had thousands of ideas to draw and some kids not so much. I made an effort to try to sit by the kids that felt less sure about their drawing and help them develop ideas; just because they didn’t have the ability to draw it didn’t mean they had nothing to say. I recall at the end of one session, one of these girls hugged me after I’d spent time helping her. We were careful to assure the kids their ideas would be well represented, but also remind them that it would be impossible to paint every idea on a little square of sidewalk. This project was never meant to be about picking the one best idea that a kid did and doing it right on the sidewalk, it was more about the group effort. At the point I’m writing this storm drains are finally being painted with help from the school kids. Designs needed to be approved by the city, schools need to be able to coordinate with us when they’re free, and lastly we need to pray that it doesn’t rain the day we want to paint. It showed me how long a process can take, but I still can’t wait to see the end results of all these storm drains. --Lexie Brada, UW Service Learning class. The students at Mt. Horeb High School needed to find a way to address the mental health struggles they knew were so often suffered by their classmates in silence. Mental wellness is a topic that many of us struggle to talk about; we don’t know the right words to say or how to say them. But a small group of compassionate Seniors decided that they were not going to let everyone remain silent. They would open a dialogue to help ensure that Mental Wellness is something that everyone can talk about, to make the path to seeking help less difficult and to break down the stigma that still so often surrounds the issues. These students, Kristen Koenig, Lexi Ricci, and Taylor Roys were dedicated to their goal and the issue was very near to their hearts as all had been deeply affected by the recent tragic suicide of close friend and classmate. Art teachers Anna King and Dana Showers, as advocates for these students, reached out to DAMA. They asked if we could help them create a Mental Wellness Mural. We had recently worked with Mt. Horeb students on a mural for the Black Earth Children’s Museum. The students enjoyed the paint days and the teachers saw how creating together fostered conversation and engaged students minds. We were humbled by the opportunity to help these students to help each other. The mural began with conversations; the student’s stories, drawings and a quote “I lift my chin, and embody the light” informed our creative process. DAMA artists, inspired by the project, came up with different designs for the students and teachers to choose from. The group decided on my image of a jungle, lush and green to give a feeling of warmth in the cold and dark. One side is overgrown with foliage, this transitions to a side that is more open with sunshine falling through the trees. The foliage would be a collage of leaves that all displayed an inspirational, positive, or heartfelt message from the students. The seniors created a presentation to share their vision and goal with the school and they gathered messages from everyone. 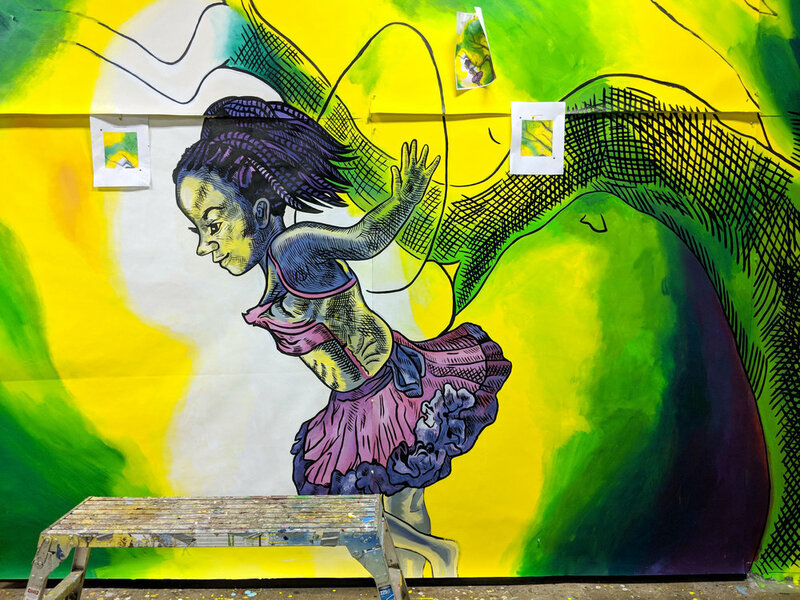 DAMA had one week in the school to engage with students and create a mural. 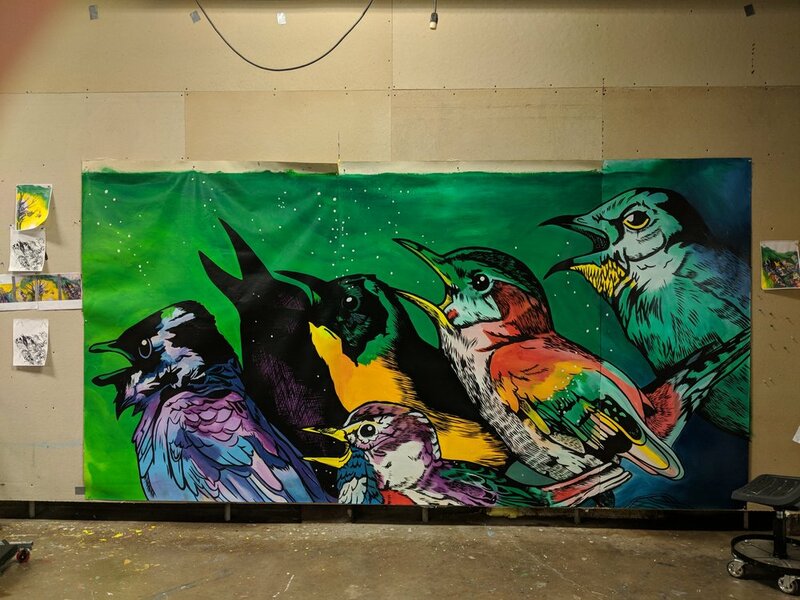 Because of future school renovations I designed the mural to be painted on eight 4’ by 4’ panels that could each be housed separately until it had a permanent home. Showers and King shared a sign up sheet with other teachers and by day one this sheet was full! Over the course of our week at Mt. Horeb High School over 1,000 students took part in creating their Mental Wellness Mural! One thousand students, plus teachers, parents and community members came together! This project had many parts, some students painted the forest, others smooshed and cut poly-tab. We created lettering stations where students carefully painted the messages that had been gathered. While painting these messages students were also able to read what their classmates had written and share in a dialog on the issues driving the project. Each step engaged students from across the spectrum of artistic ability and scholastic aptitude. The Seniors wanted to let their classmates know that they are not alone and through this project they were able to bring a school community together in a way that won’t soon be forgotten. The experience is something they will all hold onto and the mural itself will stand with their messages to future students - letting them know that when all seems dark, there is still light. The Mt. Horeb Mental Wellness mural will be unveiled at a dedication ceremony in the school on May 8th 2018 at 3:30. At Dane Arts Mural Arts artists work with at risk youth, communities and schools to beautify our neighborhoods. The work of creating a mural takes a combination of human effort and the proper tools to do the job. Sometimes we take our tools for granted. After years of use in the hands of both artists and the newly initiated the brushes we use become too hard or too bristly, too wild to paint a straight line. We trim the bristles, soak the brushes, and bring in our tools from home to get the job done. Our priorities lie in interacting with the community, we can make do with an old tool that’s been given a trim. But, oh the joy of a new brush! We would like to thank Artist and Craftsman Supply in Madison, WI for the generous donation of a bucketful of beautiful new brushes. These tools will help give students and community painters confidence in their brushstrokes; they will help to keep our lines straight and our washes true. Sometimes the little things, like a clean soft brush, can remind us of how beautiful this work can be. Thank you Jason and Artist and Craftsman Supply! Your brushes will be put to good use. Some of you may have heard about the early October tagging incident on the “Water, Land, and Sky” mural on South Broadway in Monona. If you weren’t aware it may be because the defacement was merely a temporary act - it appeared early on a Monday morning and by evening it was gone. The artists, students and community members who supported, painted and loved this mural planned ahead to assure that, to the best of our ability, it would be protected from vandalism. Thanks to the help of the amazingly knowledgeable staff at Hallman Lindsay Paints, DAMA had the right product to put to the test. Before we began installing spring murals we met with John Devries at Hallman Lindsay’s Sun Prairie headquarters to learn about anti-graffiti product options and to get a hands-on tutorial of proper application and removal of various types of graffiti. We took this knowledge to the shop and tested the products on different types of painted surfaces with various qualities of spray paint. We had two high quality products to choose from to protect our community murals. The first is a permanent layer that allows for most of the graffiti to be washed off of the surface without damaging the painted wall. The second, Okon Graffiti Barrier Coat, is a sacrificial layer that comes off with the graffiti. This layer needs to be reapplied after each removal but when removed the original work was restored beautifully. With research complete, DAMA artists applied two coats of this sacrificial anti-graffiti product to all 120 feet of the Monona mural. The product went on not long before “Water, Land, and Sky” was defaced along with area homes and businesses by what police believe was the work of gang members. The community came together once again and worked to restore the beauty of a mural that has come to mean a lot to many people. 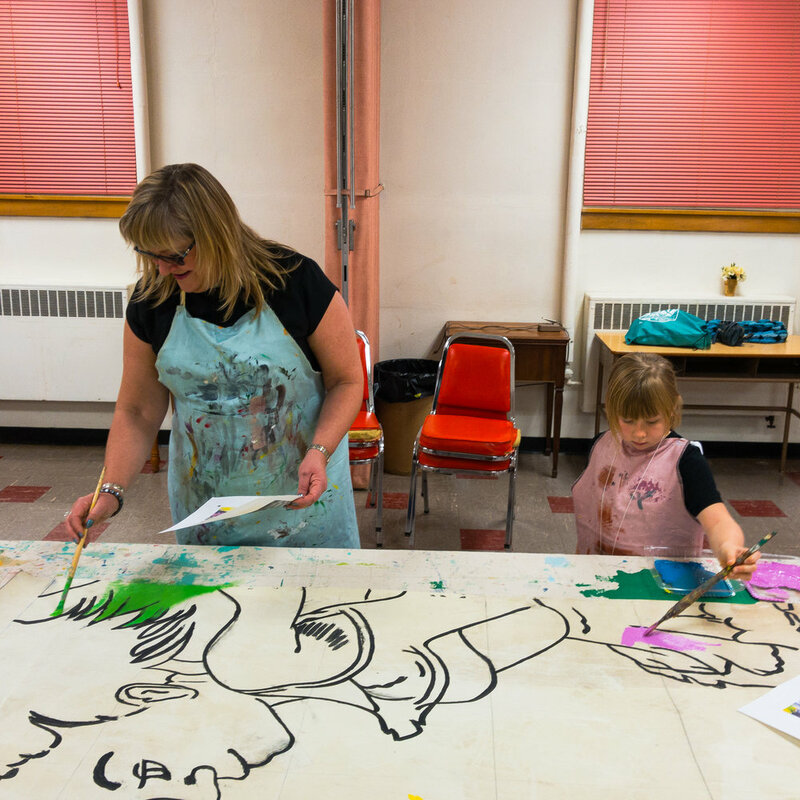 Members of the Whitehorse family worked alongside lead artist Alicia Rheal, Hallman Lindsay west manager Nancy Stilwell, county workers and neighbors to remove the hurtful scrawl from a mural designed to honor the cultural heritage and history of Monona. We wish that vandalism like this did not happen and as an organization DAMA strives to give troubled kids a paintbrush and a project in hopes of making a positive impact on young lives. Our hopes are high that the work will be respected, but, when creating accessible outdoor murals like the one in Monona we need to be prepared for any eventuality. We are grateful to Hallman Lindsay Paints for donating paint for our projects, sharing their time and knowledge and helping us to be prepared for the worst case scenario. Dane Arts Mural Arts Is EVERYWHERE!!! Our artists have been busy. This spring DAMA is finishing – and dedicating – 7 murals and one exhibit throughout Dane County! On Tuesday April 18 we dedicated a lovely mural on the 11th floor of the YWCA’s community room on the capitol square. The community room serves many functions – including the site for child care for residents of the YWCA’s housing programs. Then 3 days later on Friday April 21 we dedicated a fun & exciting mural at the City County Building. This mural is a partnership with the Madison Children’s Museum – and their “Take the Stairs” “Stair Trek” program to get Madisonians to live healthier lives & consider “taking the stairs.” The mural is in 2 stair wells at the rear of the building – by the police station entrance & is a compilation of drawings done by children at the museum depicting their favorite places & things to do in Dane County – the “Hidden Treasures” of Dane County. On Thursday May 4 DAMA is tremendously excited to celebrate an exhibit of self-portraits done by alternative high school students with whom DAMA has worked – making murals – at Madison West High School’s SAIL program and at Sun Prairie’s Prairie Phoenix Academy. 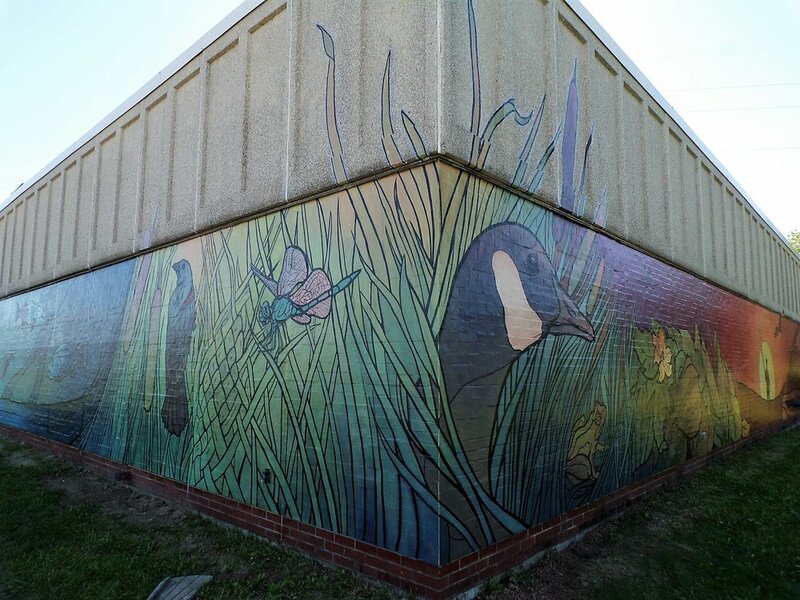 Later in the month on Wednesday May 31 we will be dedicating a wonderful outdoor mural at Randall Elementary School on Madison’s near west side – painted with all Randall Students – and with SAIL West alternative high school students. And on Tuesday June 6 we will be dedicating a mural at Atlas Drive Play Haven – on Madison’s far east side – painted with alternative students from La Follette High School in Madison. Coming up after that we will be dedicating large outdoor murals in Monona & Waunakee – and also one painted with Madison East SAIL students that will be installed on the side of the Kipp Corporation. All this – and we have moved! Dane County is generously leasing us a fabulous mural production building in the old Town of Blooming Grove Fire Station on Stoughton Road – and we could not be more excited. We promise to keep you posted – and to invite you to a grand opening of our new space later in the summer. DAMA lead artists shared a community meal with YWCA residents to hear about their ideas for the space in which they have meals, have meetings and where their children play. The artists then took the input from YWCA residents and staff members and turned the community room / child care area into a “wonder world” of positive fun images. 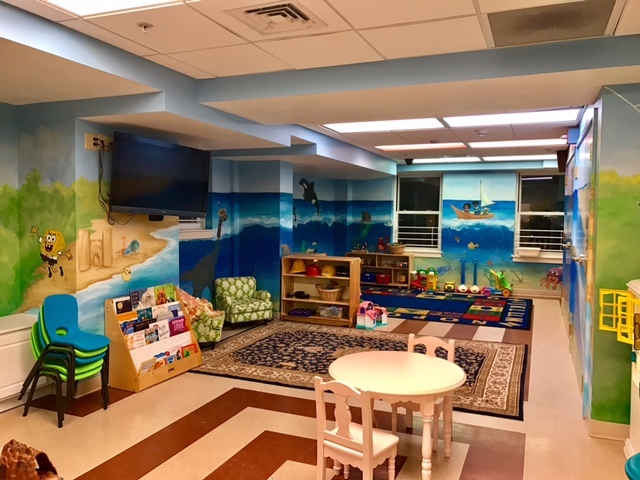 Students from Madison West High School SAIL ( Student Achievement through Individualized Learning) program worked alongside DAMA community artists and volunteers to transform this interior space that will provide many years of enjoyment for the YWCA residents. Mural at Randall Elementary School, Madison. DAMA had our biggest turnout ever for a public painting day with the awesome Regent Street neighborhood public painting day at Randall Elementary School. More than 100 students, family members and other volunteers worked alongside DAMA community artists to create a vibrant exterior mural that tells the story of kindness within the Randall community. Emi Bender was one of the Summer Institute students this Summer. Here is what she had to say about her experience. the first scale drawings to signing the piece at the end. I was also given the opportunity to apply my own hand in painting and drawing. drawing to a large wall, how images are perceived from a distance versus up close, and how to work on a textured wall. The second project, a landscape collage for the Madison Literacy Network, gave me experience in color washes, priming panels, color matching, and how to create the illusion of light and depth in landscapes. The last thing I completed was a lifesize painting of a flamingo for the Fitchburg bike path, which allowed me to practice painting from reference images and mixing colors for highlights and shadows. I would recommend the DAMA summer volunteer program to any high school student, but especially aspiring artists. There is no substitute for working alongside professionals and witnessing the entire process, and I’m so glad I found DAMA and got to participate." DAMA dedicated 3 new murals in 3 months! 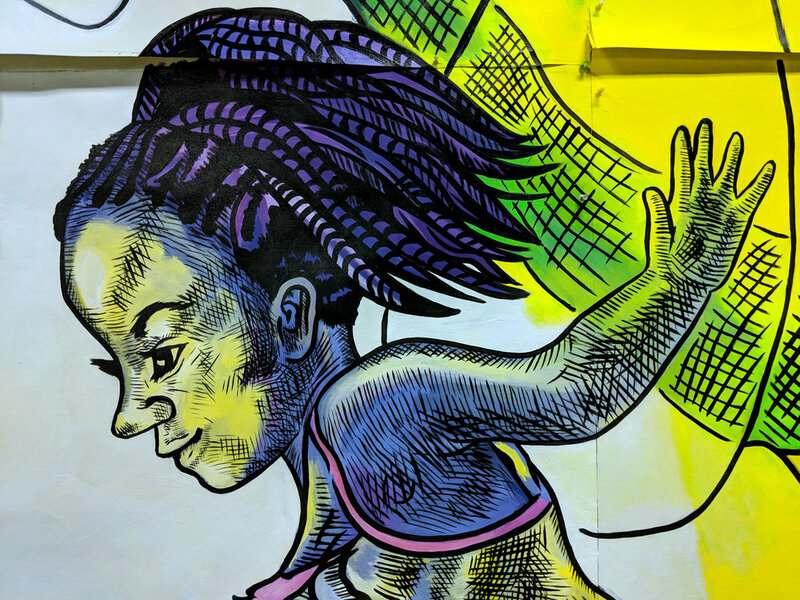 On April 26 community members celebrated with DAMA lead artist Emida Roller who worked with alternative high school students from the SAIL East program and with Lindbergh Elementary School students to create a magnificent exterior mural at Lindbergh School on Madison's far north side. On Thursday May 26 join DAMA at noon in Sun Prairie to celebrate lead artist Alicia Rheal's work with Prairie Phoenix Academy alternative high school students in creating murals on four sides of the concession stand at Angell Park. 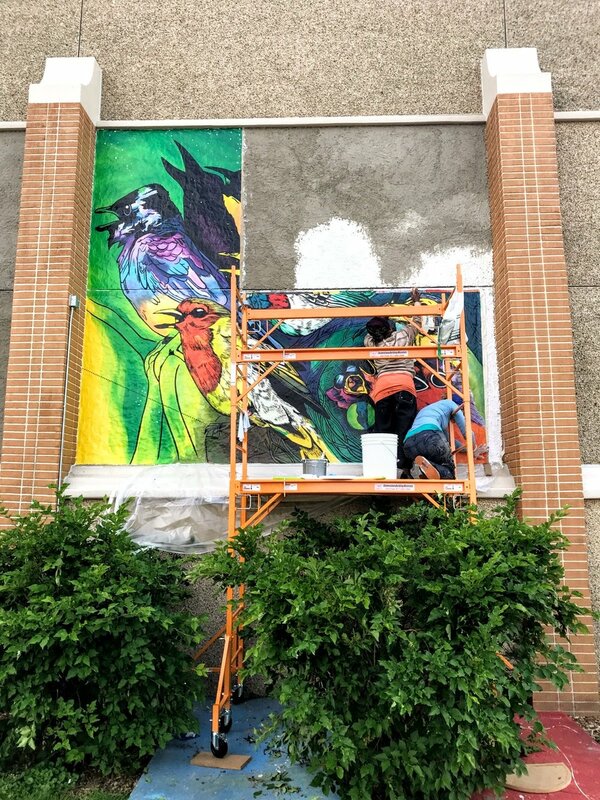 On Thursday June 2 join DAMA at 10am in Middleton to celebrate lead artist Emida Roller's work with Clark Street Community School alternative high school students and Sauk Trails Elementary School students in the creation of a mixed media mural at Sauk Trails School. It has been a little over a year now since Dane Arts agreed to take me on as a partner in creating a county-wide mural program - and what a year it has been! · To positively affect as many lives as possible, especially youth. We worked with tons of young people, lots of volunteers and many community partners. During 2016, we will work to build the infrastructure that will enable DAMA to become a viable program happily housed within county government for many years to come. We are eternally grateful for all the support we have received – financial and otherwise. Without you- sharing this vision with us - none of this transformative work could happen. P.S. Please sign up for our newsletter!